Reason: The build was not popular enough to keep pursuing. 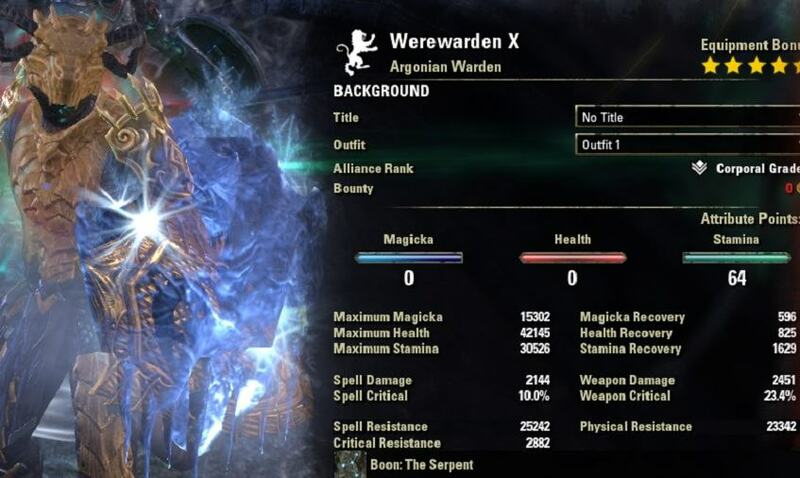 Welcome to the Warden Build PvP “Wardenwolf” for Elder Scrolls Online. Make sure to bookmark the link as I will keep updating the build for each new Update of ESO. This build is optimized for Battlgrounds and Cyrodiil. 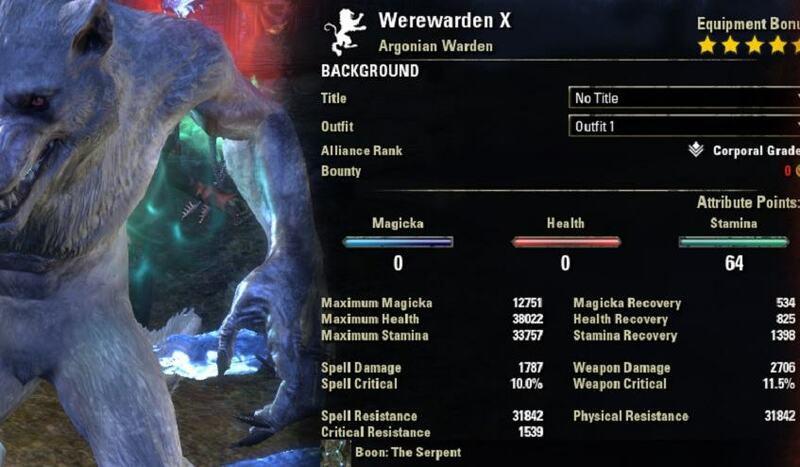 The Warden Build PvP “Wardenwolf” is a Heavy Armor tanky Werewolf Build with insane stats as you can see in the picture below. Wardens have an insanely fast ultimate regeneration, therefore we can get the very expensive Werewolf Ultimate ready faster than with other classes, which means we get more Werewolf time! Heavy Armor, a lot of Health and a lot of resistance stats we get very tanky and powerful both in dealing damage and healing as a Werewolf. We utilize Green Pact, The Troll King and Prisoner's Rags as Sets. 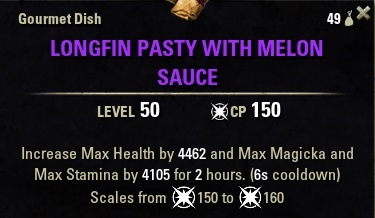 Green Pact gives us overall a lot of increased stats, especially health which also boosts our Hircine Rage heal by a lot. Troll King in combination with Green Pact once health is below 60% boosts our health recovery like crazy and Prisoner’s Rags is responsible for our magicka sustain, it takes a while to get used to it but once you know how this set is perfect. 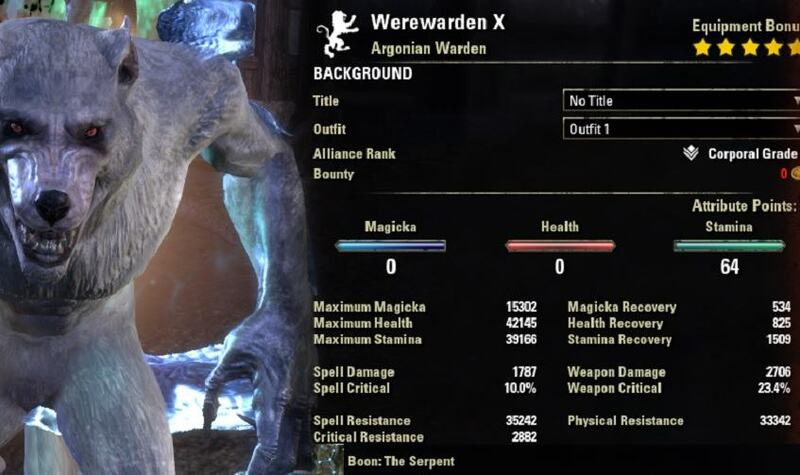 This build was added with the Wolfhunter DLC in the Summerset Chapter. Bull Netch helps us with stamins sustain whereas Prisoners Rags helps us with magicka sustain. In addition, Heavy Attacks in Werewolf restore 100% more stamina than our human form heavy attacks, so they are a very powerful tool to keep in mind! Shimmering Shield amps up our Ultimate regeneration in combination with Heroic Slash and also restores Magicka if a projectile hits the shield. Ice Fortress, Weapon Damage Enchantment and Essence of Speed Potion were active when I took the screenshot. Most important thing here is that we need 120 Points in The Atronach for the Tactician Perk, which sets enemies off balance every time we dodge roll. Once enemies are set off balance the Exploiter Perk in the Ritual Tree will proc and give us 10% more overall damage! 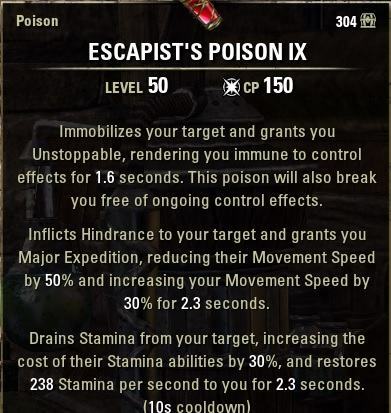 Poisons are optional, I like to run them on the two hander bar, especially vs better players those poisons can help a lot and decide a battle.